Making her debut, outstanding from the very start of proceedings; guiding India to a first ever gold medal in the Women’s Team event at a Commonwealth Games; on the evening of Saturday 14th April in the Gold Coast she steered India to a very first in the Women’s Singles event. The no.4 seed, she beat Singapore’s Yu Mengyu, the no.3 seed, to win the Women’s Singles title; furthermore, she succeeded in a most impressive manner, she won in four straight games (11-7, 11-6, 11-2, 11-7). However, at the start of the contest, it appeared that Yu Mengyu held the answers. It seemed she had found a way to combat the Indian blocking style of play from the long pimpled rubber on the backhand combined with controlled attacking play from the forehand. She established a 6-1 lead; it was at that stage, the total ethos of the contest changed. Yu Mengyu won just one more point. 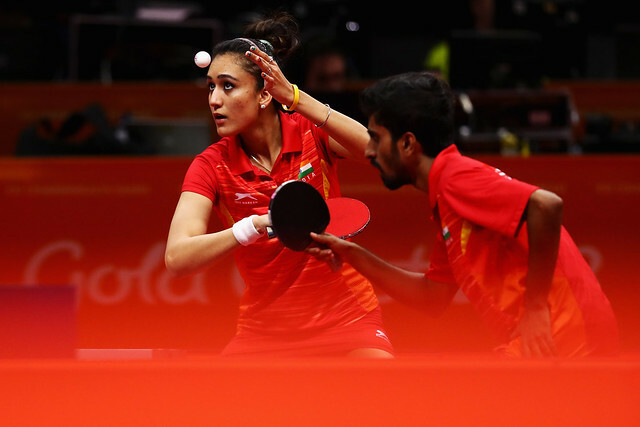 The early advantage was with Manika Batra, it was an advantage on which she built; the second game secured, she never looked back. Defeat for Singapore but in the bronze medal match it was success. Feng Tianwei, the winner in both New Delhi in 2010 and four years ago in Glasgow beat Canada’s Zhang Mo (11-2, 11-7, 5-11, 8-11, 11-7, 11-3) to secure the third step of the podium. A third consecutive Commonwealth Games for Feng Tianwei but is it her last? Bronze for Feng Tianwei, gold for Manika Batra, for Yu Mengyu silver yet again; she was the runner up in both New Delhi and Glasgow.